Southampton, England continues to grow in popularity as a cruise port. Indeed, its importance to the cruise industry was underscored by the fact that the two most eager anticipated new ships of 2013, Norwegian Breakaway and Royal Princess, were brought to Southampton fresh from the shipyards where they were built. However, beyond these special events, Southampton is of interest to cruise and ship enthusiasts because it is a great place to view and photograph ships. On this page and those that follow, we show some of the ships that called in Southampton during three days in May 2013. Southampton is the de facto home of "Britain's Favorite Cruise Line" P&O Cruises. Thus, one can usually expect to see one or more P&O ships during a stay in Soton. 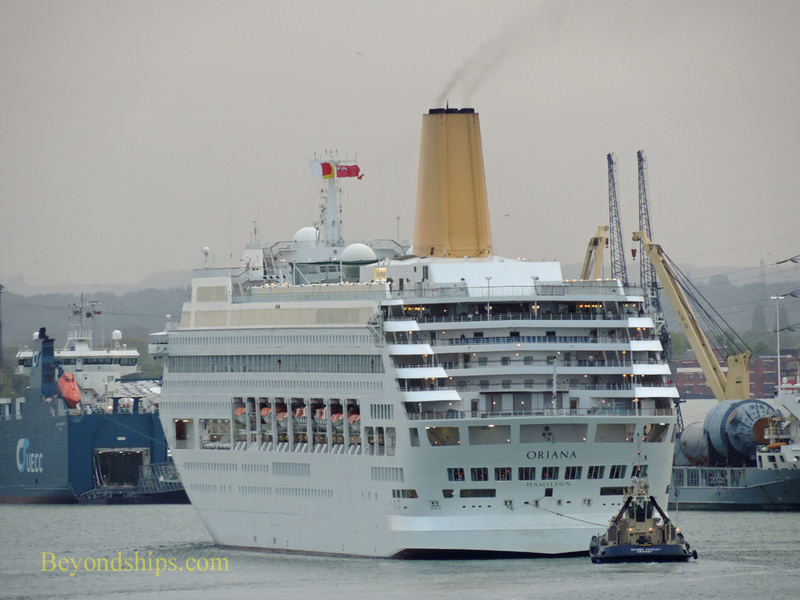 Here, Oriana returns home, passing the Queen Elizabeth II Terminal at the entrance to the main part of the harbor. When Oriana entered service in 1995, she was an instant hit. Built by Meyer Werft, she was state-of-the-art and quite large for her time (69,153 gross tons). Although ships have become much bigger and more elaborate, Oriana with her elegant lines still maintains a loyal following. She is seen here returning from a cruise to the Norwegian fjords. Oriana crosses to the far end of the harbor and docks at the Mayflower Cruise Terminal.